R2-D2 cake I made for Will's 4th birthday party. That cake looks fantastic! Did you use the R2D2 cake pan? Happy WW! Great job on the cake! You are talented! I didn't know there was an R2-D2 cake pan! 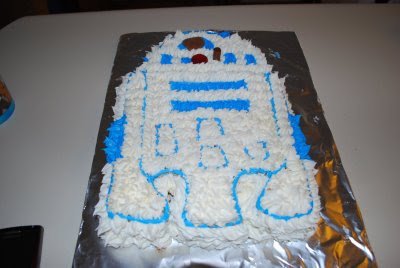 I just froze a cake baked in a 11X13 cake pan, then cut out a R2-D2'ish shape. Cake pan?! I had no idea! What a great cake. Children always remember their favourite birthday cakes. What a wonderful memory to have. You did a great job. My youngest would love it. And you say your AREN'T a domestic goddess? Think again! What a fun cake! Great cake, I'm impressed, thanks for sharing!